Wolfram syndrome is an autosomal recessive disorder characterised by childhood diabetes mellitus, optic atrophy and severe neurodegeneration, resulting in premature death. The aim of this study was to investigate the mechanisms responsible for the phenotype of carbohydrate intolerance and loss of pancreatic beta cells in this disorder. To study the role of the Wolfram gene (Wfs1) in beta cells, we developed a mouse model with conditional deletion of Wfs1 in beta cells by crossing floxed Wfs1 exon 8 animals with mice expressing Cre recombinase under the control of a rat insulin promoter (RIP2-Cre). Complementary experiments using RNA interference of Wfs1 expression were performed in mouse insulinoma (MIN6) cell lines (WfsKD). Male knockout mice (βWfs −/−) began developing variable and progressive glucose intolerance and concomitant insulin deficiency, compared with littermate controls, by 12 weeks of age. Analysis of islets from βWfs −/− mice revealed a reduction in beta cell mass, enhanced apoptosis, elevation of a marker of endoplasmic reticulum stress (immunoglobulin heavy chain-binding protein [BiP]), and dilated endoplasmic reticulum with decreased secretory granules by electron microscopy. WfsKD cell lines had significantly increased apoptosis and elevated expression of the genes encoding BiP and C/EBP-homologous protein (CHOP), two markers of endoplasmic reticulum stress. These results indicate that (1) lack of expression of Wfs1 in beta cells was sufficient to result in the diabetes mellitus phenotype; (2) beta cell death occurred by an accelerated process of apoptosis; and (3) lack of Wfs1 was associated with dilated endoplasmic reticulum and increased markers of endoplasmic reticulum stress, which appears to be a significant contributor to the reduction in beta cell survival. A.C. Riggs and E. Bernal-Mizrachi contributed equally to this study. Wolfram syndrome is a rare autosomal recessive disorder characterised predominantly by juvenile onset insulin-dependent diabetes mellitus and optic atrophy [1, 2]. The gene for Wolfram syndrome (WFS1) was identified by positional cloning in 1998 [3, 4], and was shown to be an endoplasmic reticulum (ER) membrane protein [5, 6] expressed at highest levels in brain, heart and pancreatic islets . Based on association or linkage studies, WFS1 may influence susceptibility to type 2  or type 1  diabetes, although its role in these disorders remains uncertain. The mechanisms involved in the development of diabetes in Wolfram syndrome remain obscure, but decreased pancreatic islet beta cell mass and disrupted islet architecture have been observed, with no evidence of immune-mediated destruction . Based on homology with the previously described genes Sel1 and Hrd3p in lower organisms, WFS1 may serve to alleviate the ER stress that accompanies the unfolded protein response . Recent data also suggest that the gene might be important in the regulation of intracellular calcium homeostasis . Given current technologies, these possibilities are difficult to assess in affected individuals. The present report describes the metabolic abnormalities of an animal (mouse) model with beta cell-specific deletion of Wfs1 and extends the observations described by Ishihara et al. using conventional knockout mice . Complementary to the in vivo model, the present work describes in addition the role of decreased Wfs1 in vitro in insulinoma cell lines. The results of these studies indicate that Wfs1 is critical to beta cell survival and that deficiency of Wfs1 predisposes to diabetes through enhanced ER stress. The targeting construct to introduce loxP sites into Wfs1 was created from a Wfs1-positive clone containing exon 8 from a 129SvJ mouse BAC genomic library screen (No. 24675, kindly supplied by Y. Oka, Tohoku University, Sendai, Japan). The 3.3-kb targeting vector using the 38LoxPNeo backbone (a modified version of pGT-N38 from New England Biolabs, Beverly, MA, USA) contained exon 7, flanking intronic sequences, a 5′ loxP site, exon 8, a neomycin-resistance cassette followed by a 3′ loxP site and 3′ untranslated region (UTR) sequence (Fig. 1a). Linearised 38LoxPNeo/Wfs1 was transfected into embryonic stem cells derived from 129SvJ mouse blastocysts. Selection was performed with G418, a neomycin analogue, and 192 resistant clones were screened for homologous recombination by Southern blotting using 5′ and 3′ external probes and an internal neo probe. Targeted embryonic stem cells from two clones were microinjected into C57BL/6 mouse blastocysts. Generation of chimeric mice and germ-line transmission of the mutant allele were achieved using standard techniques. The RIP2-Cre animal was provided by P. Herrera . Genomic PCR for the detection of the loxP allele was performed by extracting DNA from mouse tails. Blood glucose, glucose tolerance tests, serum insulins and in vivo insulin secretion were measured for male mice only, as previously described . Differences in values were assessed by two-tailed t-test, and for insulin secretion we used the Wilcoxon signed rank test. Glucose concentrations were obtained in animals fasted for 6 h.
Forty micrograms of protein was loaded on a 7% polyacrylamide gel, electrophoresed, transferred to PVDF (polyvinylidene fluoride) membrane and Wfs1 was detected by N-terminal mouse Wfs1 antibody (provided by Y. Oka, Tohoku University, Sendai, Japan). Islets were isolated by collagenase digestion as described . Antigens were retrieved by microwaving (4 min ×2) in 0.01 mol/l sodium citrate and 0.01 mol/l citric acid. Immunostaining for insulin and immunofluorescence was as described . Detection of insulin was performed in five sections. The percentage of beta cell area in the pancreas was calculated from five sections separated by 200 μm previously immunostained for insulin. The insulin-stained area was divided by the exocrine area and the ratio was multiplied by the pancreas weight to obtain beta cell mass. Cleaved caspase 3 staining was measured with polyclonal anti-caspase 3 antibody (Biocarta, Carlsbad, CA, USA) at 1 : 500 dilution and the Histomouse-SP kit (Zymed Laboratories, South San Francisco, CA, USA) using 3-amino-9-ethyl carbazole as chromogen. Islet cells were counted in a blinded fashion for positive caspase 3 staining and reported as percentage positive islet cells. Beta cell replication was determined by 5-bromo-2′-deoxyuridine (BrdU) incorporation on insulin and BrdU double-stained slides, as previously described . Electron microscopy was performed in pancreases from mice dissected and sectioned in small fragments followed by fixation, staining with 4% uranyl acetate and embedding in Polybed 812 as described . Thin sections were cut and viewed in a JEOL 1200 electron microscope. The images were analysed by an electron microscopist who was blinded to the experimental conditions. The beta cells were separated from alpha and delta cells by the appearance of the secretory granules. Beta cell granules have a white halo which is not apparent in alpha or delta cells (easily identified by the characteristic appearance of the granules) [15, 16, 17]. Total RNA was used to prepare cDNA using random hexamers, and reverse-transcribed with Superscript II (Invitrogen, Carlsbad, CA, USA) according to the manufacturer’s protocol. Quantitative RT-PCR was performed by monitoring in real time the increase in fluorescence of the SYBR Green dye (ABI) as described [18, 19] using the ABI 7000 sequence detection system (Applied Biosystems, Foster City, CA, USA). For comparison of transcript levels between samples, a standard curve of cycle thresholds for serial dilutions of a cDNA sample was established and then used to calculate the relative abundance of each gene. Values were then normalised to the relative amounts of 18S rRNA (encoded by Rn18S) or Slc2a2 (formerly known as GLUT2) mRNA, which were obtained from a similar standard curve. All PCR reactions were performed as replicates of three. The standard error of the quantity of transcript normalised to the amount of 18S rRNA or Scl2a2 mRNA was calculated from a formula with consideration of error propagation. Sequences of primers used in this study were: Wfs1, 5′ CCAGCTGAGGAACTTCAAGG and 5′ AGGATGACCACGGACAGTTC; Slc2a2, 5′ CTGGGTCTGCAATTTTGTCA and 5′ AGGCCCAAGGAAGTCCGCAA; Hspa5 (which encodes immunoglobulin heavy chain-binding protein [BiP]), 5′ TTCAGCCAATTATCAGCAAACTCT and 5′ TTTTCTGATGTATCCTCTTCACCAGT; Ddit3 (which encodes C/EBP-homologous protein [CHOP]), 5′ ATTGGGGGCACCTATATCTC and 5′ TTGCTCTTCCTCCTCTTCCT; Rn18S, 5′ GGTGGTGCATGGCCGTTCTTAGTT and 5′ GCTGAACGCCACTTGTCCCTCTAA. A polIII-mediated small interfering RNA-expressing plasmid vector system (pSUPER vector) was constructed according to the methods described by Brummelkamp et al. . Sixty-four-base DNA oligonucleotides, corresponding to sense target sequence, hairpin loop and anti-sense target sequence, were synthesised (Integrated DNA Technologies, Coraville, IA, USA), annealed together, and then ligated into BglII- and HindIII-digested pSUPER vector. Plasmids were purified with Wizard Plus Maxipreps kit (Promega, Madison, WI, USA). The target sequence against mouse Wfs1 in this study was GAAGTCCTGGAGAAAGCCA and the scrambled control sequence was CCCAGGCCCAGCATACCA. The MIN6 insulinoma cell line was used between passages 24 and 26 and was provided by J. Miyazaki . Cotransfection of pSUPER vector and pcDNA 3.1 plasmid, which contains a neomycin-resistance cassette to facilitate the selection of stably transfected cells with G418, was performed as described . After 4 weeks of selection with G418 (Mediatech, Herndon, VA, USA), colonies of the surviving cells (defined as passage 4) were selected. Protein levels and mRNA expression were tested at passage 7 or 8, and clones were further maintained. MIN6-Con(E), MIN6-Con(S) and WfsKD cells were used for experiments between passages 9 and 18, which corresponded to passages 33 and 42 of the parental MIN6 cells. After plating for 48 h in standard media, cells were trypsinised and resuspended in annexin V buffer according to protocol (Annexin V-FITC [fluorescein isothiocyanate] Apoptosis Detection Kit; Biovision, Mountain View, CA, USA) and apoptosis was measured as the amount of annexin V-positive cells by flow cytometer. To generate a conditional Wfs1 mouse model of Wolfram syndrome, we designed a targeting vector that contained loxP sites flanking exon 8 of the gene (Fig. 1a). Exon 8 encodes the transmembrane domain and two-thirds of the protein, and the majority of the mutations in affected individuals are in this exon. Mice containing loxP sequences flanking exon 8 of the gene were crossed with mice expressing Cre recombinase under the control of the rat insulin promoter (RIP2-Cre) . To confirm the deletion of Wfs1 in pancreatic islets, lysates from animals lacking Wfs1 in insulin-producing cells (βWfs −/−) and littermate loxP/loxP (control) animals were subjected to immunoblotting using an antibody that recognises an epitope encoded by exon 8 (Fig. 1b). Expression of Wfs1 in non-islet tissues appeared to be preserved (Fig. 1c). These data suggest that the Cre-loxP system resulted in mice with marked deficiency of the Wfs1 protein specifically in pancreatic islets. βWfs −/− mice were born at expected Mendelian ratios with no differences in reproductive success. βWfs −/− animals and control animals had similar weights during the first 16 weeks of life, but at 24 weeks the βWfs −/− animals had lower weights when compared with control mice (Table 1, p<0.05). The reduction in weight at 24 weeks occurred at a time when the βWfs −/− mice had developed hyperglycaemia and insulinopenia relative to controls (Table 1). At 8, 12, 16 and 24 weeks of age, mean fasted glucose concentrations did not differ between βWfs −/− and control animals (Table 1). Fed glucose concentrations were significantly higher in βWfs −/− animals only at 24 weeks (p<0.05). Fasting insulin levels were significantly reduced in the βWfs −/− mice at 12 weeks (p<0.05). Fed insulin concentrations were significantly reduced in 12- and 24-week-old βWfs −/− mice (p<0.05). Both fasting and fed glucose : insulin ratios were elevated in βWfs −/− mice at 12 and 24 weeks of age (p<0.05), further illustrating the insulinopenia for the degree of hyperglycaemia in these mice. Glucose tolerance did not differ between the two groups at 8 weeks (Fig. 2a). By 12 weeks, mild glucose intolerance 60 min after glucose injection was observed in βWfs −/− animals (Fig. 2b). Glucose tolerance in 16-week-old βWfs −/− animals was significantly impaired 30, 60 and 120 min after glucose injection (Fig. 2c, p<0.05). By 24 weeks, nearly all βWfs −/− animals exhibited significant glucose intolerance (p<0.01) (Fig. 2d). Moreover, two of 13 animals had developed severe fasting hyperglycaemia by this age, one of which died at 20 weeks of age. The RIP2-Cre mice used in these studies had glucose tolerance that was not different from the loxP/loxP littermate control mice or wild-type mice (data not shown). The results of these experiments indicated that conditional inactivation of Wfs1 in pancreatic beta cells results in progressive glucose intolerance and diabetes. To further assess beta cell function in βWfs −/− mice, insulin secretion was evaluated. As seen in Fig. 3a, the glucose-stimulated insulin responses were significantly impaired in βWfs −/− animals (p<0.05). Comparison of the glucose : insulin ratio at 30 min further illustrated the impairment in insulin secretion in the βWfs −/− animals (Fig. 3b). Immunostaining for insulin and non-beta cells (somatostatin, glucagon and pancreatic polypeptide) showed that control animals at 12 and 24 weeks had the characteristic appearance of islets, with abundant beta cells in the centre and a rim of non-beta cells at the periphery (Fig. 4a). In contrast, although the beta cell mass did not differ between βWfs −/− and control (Fig. 4b), asymmetry and disruption of islet architecture was already apparent and was correlated with the relative hypoinsulinaemia at 12 weeks of age. At 24 weeks, there was further disruption of islet architecture, with marked alteration of the ratio of beta to non-beta cells within the islet. Pancreas weight in 12- and 24-week-old mice was not different between the groups (Table 1). Neither the beta cell : pancreas ratio nor beta cell mass was different at 12 weeks (Table 1 and Fig. 4b). Reduction of the beta cell : pancreas ratio and beta cell mass in βWfs −/− mice was observed at 24 weeks of age, suggesting that the decrease in beta cell mass was one of the components responsible for diabetes in βWfs −/− mice (Table 1 and Fig. 4b). In the βWfs −/− mice at 24 weeks of age the apparent beta cell dysfunction could result from impaired proliferation or enhanced apoptosis of beta cells. Pancreatic islets were examined by immunohistochemistry with an antibody to the active subunit of cleaved caspase 3 [23, 24]. A significant increase in caspase 3-positive nuclei in βWfs −/− animals compared with control animals at 12 weeks of age was noted (p<0.05) (Fig. 5a). This 2.5-fold increase in caspase 3-positive cells in βWfs −/− animals could be an explanation for the reduced beta cell mass and diabetes noted in this model. The frequency of beta cells that were BrdU- and insulin-positive revealed no differences between control and βWf −/− animals at 12 weeks or 24 weeks (Fig. 5b). ER stress was assessed by measuring the relative levels of expression of mRNA encoding the ER stress-associated proteins BiP (Hspa5) and CHOP (Ddit3). Given that markedly fewer beta cells in knockout animals, ER stress mRNA expression was normalised to Slc2a2 mRNA instead of 18S rRNA to reflect more accurately the expression of ER stress proteins, specifically in beta cells. Slc2a2 expression was decreased in proportion to the decrease in beta cell mass when normalised to 18S RNA, suggesting that Slc2a2 expression was not significantly altered (Fig. 5c). When corrected for Slc2a2 expression as a reflection of the percentage of beta cells per islet, Hspa5 expression was significantly elevated in islets from βWfs −/− animals compared with controls (p<0.05), whereas Ddit3 expression appeared elevated but did not reach statistical significance (Fig. 5c). To further substantiate the increased levels of ER stress in beta cells from βWfs −/−, pancreas was examined by electron microscopy (Fig. 6). The beta cells were distinguished from alpha and delta cells by the appearance of the secretory granules. The beta cell granules have a white halo, which is not apparent in alpha or delta cells. Homogeneous distribution of secretory granules was observed in beta cells from control animals (Fig. 6a). Ultrastructural analysis of βWfs −/− pancreas revealed striking abnormalities in beta cell morphology, with some cells more affected than others (Fig. 6b). Higher magnification more clearly shows that beta cells from control mice exhibit abundant secretory granules, with the normal morphological appearance of the ER (Fig. 6b and c). In contrast, beta cell secretory granules from βWfs −/− islets appeared to be reduced and the majority of the beta cells exhibited abundant dilated ER (Fig. 6b and c). These abnormalities were more significant in some beta cells from βWfs −/− mice and were never observed in multiple sections from age-matched control animals. To further elucidate the molecular mechanisms of deficiency of Wfs1 expression on beta cell survival and insulin secretion, stable cell lines with reduced Wfs1 expression were created using RNA interference in MIN6 insulinoma cells. The reduction in Wfs1 expression was confirmed in two cell lines relative to that in two control cell lines. The controls for these experiments included MIN6 cells stably transfected with pSUPER plasmid containing no additional sequences (MIN6-Con(E)) and a second control containing pSUPER with a sequence identical to Wfs1-specific sequence, except for two mismatched base pairs (MIN6-Con(S)), which served as a scrambled control. Both control lines had no alterations in expression of Wfs1 (Fig. 7a). Cell lines with 50% (WfsKD50) and 70% (WfsKD70) reduction in Wfs1 expression and Wfs1 production (Fig. 7a and b, respectively) were used for these experiments. To confirm the role of apoptosis in the alterations of beta cell mass found in vivo, we next evaluated the in vitro model of Wfs1 deficiency. Apoptosis was measured by the number of annexin V-positive cells counted by flow cytometry. As seen in Fig. 7c, the two knockdown cell lines, WfsKD50 and WfsKD70, exhibited increased apoptosis when cultured under standard conditions (19.8±3.6% and 17.3±1.3% respectively compared with MIN6-Con(E) control, 8.3±0.7%; p<0.05). Thus, the in vitro observations were consistent with the in vivo results and supported the conclusion that Wfs1 is required for pancreatic islet beta cell survival. The expression of the gene encoding the molecular chaperone BiP (Hspa5), a protein associated with ER stress, was elevated in both knockdown cell lines (p<0.05) (Fig. 7d). The expression of the gene for CHOP (Ddit3), a protein integral in the apoptosis pathway that accompanies ER stress, was also significantly elevated in the WfsKD70 cells (p<0.05) (Fig. 7e). These data are again consistent with those seen in the in vivo model, further suggesting that ER stress is associated with apoptosis in these models. The in vivo model suggested a defect in insulin secretion (Fig. 3a). The in vitro system allowed the assessment of insulin secretion in the absence of metabolic abnormalities induced by chronic hyperglycaemia in vivo. Following correction for insulin content, there was no difference in glucose-stimulated insulin secretion between knockdown cell lines and controls (data not shown). In this study, a pancreatic islet beta cell-specific knockout of Wfs1 in mice resulted in a model in which the natural history and mechanisms of beta-cell dysfunction can be studied. Total disruption of Wfs1 was recently accomplished by insertion of a neomycin-resistance gene in exon 2, which contains the ATG initiation codon . Phenotypic changes were similar to those reported here with tissue-specific knockout of the gene, i.e. 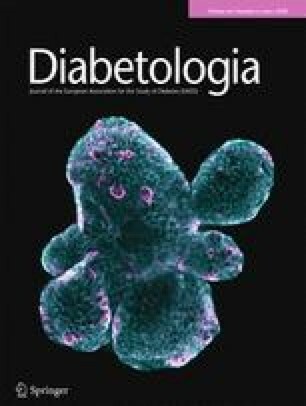 mild glucose intolerance in mice at 16–17 weeks of age, overt diabetes in over half the mice beyond 24 weeks of age, impaired glucose-stimulated insulin secretion, and reduced pancreatic insulin content and beta cell mass. One phenotypic characteristic that differed between the total and tissue-specific knockout models was the presence of increased insulin sensitivity in the former. The present study importantly extends the observations reported for the total knockout in several ways. First, the glucose intolerance of the complete knockout may be partially altered by changes in insulin sensitivity, while the beta cell-specific knockout of Wfs1 demonstrated that the carbohydrate metabolic abnormalities resulted from deficiency of Wfs1 specifically in beta cells. Second, in the previous report apoptosis was not demonstrated in vivo and was only reported in isolated islets subjected to high glucose or agents that induce ER stress. In the present report, evidence that apoptosis was a contributing mechanism for reduced beta cell mass was demonstrated by both in vivo and in vitro assays under non-stressed conditions. Third, the present study demonstrated for the first time that disruption of Wfs1 was associated with elevation of markers of ER stress and structural abnormalities of the ER in vivo. Fourth, in the present study stable MIN6 cell lines with reduction in Wfs1 expression were created and used to confirm the in vivo observations of increased apoptosis and ER stress. Finally, in the previous report there was a modest defect (23%) in stimulus–secretion coupling in isolated islets when corrected for the reduction in insulin content. In the present study insulin secretion in Wfs1 knockdown cells was normal, suggesting that the principle mechanism for impaired insulin secretion in vivo results from loss of beta cells via enhanced ER stress, with resultant apoptosis. The glucose intolerance in male βWfs −/− mice started as early as 12 weeks, progressed with age and some animals (two out of 13) exhibited overt diabetes. The variable penetrance of the phenotype could be explained by the mixed background. This defect resulted from impaired glucose-stimulated insulin secretion (Fig. 3a). However, at this point it was not possible to distinguish a primary secretory defect from one due to diminished islet beta cell mass. The decreased number or absence of secretory granules found by electron microscopy in beta cells from βWfs −/− mice suggest the presence of an insulin secretory defect. Further evaluation of this apparent secretory defect was hampered because isolation of islets resulted in a low yield of islets from βWfs −/− animals. These βWfs −/− islets were grossly smaller and less tolerant to experimental manipulation, making the in vitro study of βWfs −/− islet physiology and insulin secretion quite challenging. For these reasons, stable MIN6 cell lines deficient in Wfs1 expression were engineered to allow us to study some of the mechanisms that could explain the in vivo model. WfsKD cell lines exhibited impaired insulin secretion in response to glucose challenge, while insulin content was decreased by 50 and 70% in WfsKD50 and WfsKD70, respectively (data not shown). Thus, in contrast to observations in mice with total knockout of Wfs1 , the results of these studies provide no evidence of a primary defect of insulin secretion that is disproportionate to the decrease in beta cell mass. These studies provide both in vivo and in vitro evidence that the clinical picture of Wolfram syndrome is the result of accelerated apoptosis. A mechanism for apoptosis associated with ER stress in Wolfram syndrome has been proposed because the homology with SEL1 and Hrd3p, proteins important for the regulation of ER stress in lower organisms . Cells that have high engagement of ER apparatus, such as oligodendrocytes and beta cells, may be at increased risk of susceptibility to ER stress [26, 27]. Remarkably, the βWfs −/− mice and Wfs1-deficient cell lines had a highly significant increase in expression of the genes encoding the ER stress markers BiP and CHOP, and dilated ER, suggesting that ER stress may play a role in the apoptosis of beta cells, and perhaps in neurons, in patients with this disorder. We gratefully acknowledge B. Wice, L. J. Muglia, S. Martinez, L. Love-Gregory and C. Cras-Méneur for helpful suggestions and stimulating discussions, S. Vance and G. Skolnick for administrative assistance, and M. Shornick and Incyte Genomics for technical assistance. We also would like to acknowledge D. Accili for facilitating transfer of the RIP2-Cre mice. This work was supported in part by National Institutes of Health, National Research Service Award 1-T32-HD043010 from the National Institute of Child Health and Human Development and institutional training grant T32-DK063706 from the National Institutes of Health (A. C. Riggs), American Diabetes Association and National Institutes of Health (E. Bernal-Mizrachi), the Swiss National Science Foundation, the Juvenile Diabetes Research Foundation and the NIH/NIDDK’s Beta Cell Biology Consortium (P. L. Herrera), National Institutes of Health grants DK16746, DK56954, DK99007 (M. A. Permutt), DK19645 and AG10299 (R. E. Schmidt), and the Washington University Diabetes Research and Training Center.